Osmania University, Hyderabad, the place which gave birth to many revolutionary leaders and many revolutionary moments, continues to stand aloof amidst huge political crises, para-military forces deployed and continual surveillance of the state intelligence department. Let it be the Jai Telangana moment in 1969, 2009, Ramiza Bee incident, Naxal – Government talks and any other notable moment in the state of Andhra Pradesh, Osmania university has been a hub for political and student activities. It may be the soil or the air which sets students to believe strong ideologies and turn them into leaders. Today, when we take a look at the past, most leaders who contributed to the society from the Telangana region are the products of OU which includes Mr. P.V. Narasimha Rao who served as the Prime Minister of India and many other parliamentarians, legislatures, socialists, scientists, technologists, artists, journalists, etc. But there are numerous students leaders who went into the old news paper racks of libraries and are hardly known to people today. My father, Mr. Conda Venkatramana, an engineer from Osmania University, a former member of PDSU and a left sympathizer has always been my role model for the role he played in his student days and for his ideologies. I was always very fascinated by the ideologies of the left and always discussed with my father about the leaders who stood as inspirations, following those principles. 1. Mr. George Reddy – was a student leader, an inspiration for many engineers in the early 70’s. He was the founder of revolutionary students moment – Progressive Democratic Students Union which was a student body on the campus of Osmania University. George Reddy was a university gold medalist, a mark of academic excellence. “He possessed extraordinary intelligence and answering his question in the class was always a challenge for his professors” says my father who was a staunch follower of him. He was highly respected by his fellow students not only for his academic excellence, but for his social sense and his fight against the politically powered devils and bureaucrats. He was a PhD student and OU and worked part time at the AV College of arts as a lecturer. His charm, intellect, ideologies got him a lot of fame and fan following not only among his fellow students but also in the city of Hyderabad. Very brave, straight forward and possessing a typical angry young man look, George Reddy never cared for threats from student bodies opposing him, politicians who were pissed off by his following on campus and by goons who thought he was a threat to their business. He was a one man army and a man of action. Right from the examination dates every other aspect on campus was done in consultation with him. “PDSU remained the most powerful student body on campus and in many parts of Andhra Pradesh in the George Reddy era” says my father, who then took a very active part in the organization. George was sure to win the assembly elections but to everyones shock, he was brutally murdered by Jan Shang activist on campus in the early 70’s within the sight of the police. Being strong and physically fit none dared to attack him directly. Facing such a huge figure on campus was not an easy task, it would be something next to impossible for a group of students to kill him and get away with it. There was for sure a huge political force which planned and executed this murder with the help of a very huge mod in broad day light. “He was our leader, he inspired us to fight against unjust and stand against all odds” says my father and remembers his words “Jeena Hai tho marna seeko, Khadam khadam par ladna seeko (Learn to die if you wish to live, learn to fight at every step)”. How inspiring were his words. My dad says that this is what led him to fight for justice in incidents such as Ramiza Bee and many others. My dad was arrested in March, 1978 along with many other student leaders and legislatures like Mr. Amanulla Khan during the incident where Ramiza Bee, a poor muslim lady from Karnool district who was taken to the police station and raped by an inspector and two constables. Her husband was beaten brutally. There was a communal riot as the inspector who raped was ahindu. My father was also detained and beaten by the police for protesting against them at the Osmania Engineering college. My father says “Geroge Reddy was my inspiration and he awakened the leader in me”. Mr. Koora Rajanna Alias Anandji, the founder secretary of Communist Party of India (Marxist–Leninist) Janashakti (an organization which is the second most dominant group after CPI-Maoist and settled on a strategy of guerrilla warfare) one of the top Naxal leaders in the country who is also an engineer from Osmania University says that Geroge Reddy was his leader and inspiration and it was George who introduced him to PDSU. Koora Rajannais a mere example, many other leaders like Jampala Chandra Sekhar Prasad (who was a student leader, an active member of PDSU, who was killed in a police encounter) were staunch followers of George Reddy who continued to carry his ideologies even after his death, in pursuit of his dreams. George strongly believed in fighting to freeIndiafrom the hands ofimperialism and feudalism. He fought against commercialization, privatization and communalization of education. Even though he belonging to a forward caste, believed in reservation for weaker sections as a democratic demand. Struggle agains gender oppressionand exploitation of women were also a part of his agenda. Today Progressive Democratic Students Union is the student wing ofCommunist Party of India (Marxist-Leninist) New Democracy. Even after almost 40 years of its establishment, PDSU plays an active role not only in the campus of Osmania University but also in many parts of Andhra Pradesh, with its aims and objectives being the ideologies and principles which George Reddy fought for. All my efforts to find a picture of George were not successful. But for the people who wish to see him, I recommend you to watch the movieYuva, directed byMani Ratnam. 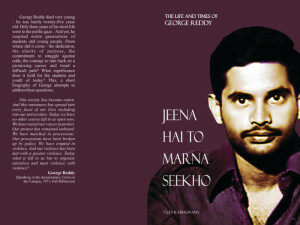 George Reddy is the inspiration for the lead character Michael in the movie. A leader, a true inspiration – the Forgotten Leader – George Reddy.